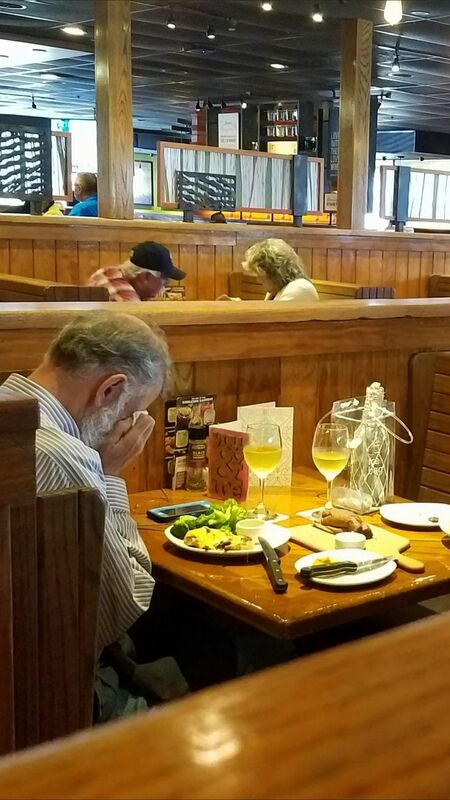 A photo of an elderly man having Valentine’s Day dinner with the ashes of his late wife has gone viral. The photo was taken by Texas resident Chasidy Gwaltney, the Daily Mail reported. It shows an elderly man at a restaurant sitting across an urn presumably containing the ashes of his late wife. The man appears to be in tears as he sits with a plate full of food and two glasses of wine. A Valentine’s Day card can also be seen on the table, with the words “You & Me” inscribed on it. You know? We are all guilty of taking our other half for granted from time to time. We may forget to give a goodbye kiss, say I love you or just be so caught up in what we are doing at the moment that we don’t notice the very little things that mean so much to our special someone. Apparently his love for her was and still is very strong as he takes her ashes out for a Valentine’s lunch date together. He even bought her a glass of wine…. Please love your Sweetheart while you have the opportunity, you never know what tomorrow will bring or take away! The photo quickly went viral, being shared more than 400,000 times in just two days. Thousands of social media users commented on the photo. Most agreed with Gwaltney. “That make me so sad!! We really do take our loved ones for granted sometimes!! So sad,” wrote one user. Other users were more skeptical. He Was Late For The Interview As He Helped Fix An Old Man’s Broken Car. But Is Gobsmacked When The Interviewer Did This.